I spent around 12 years at 4 Kirov Prospekt, one of two avenues built in Avtozavod early in the construction of this ideal workers’ district in Nizhny Novgorod. 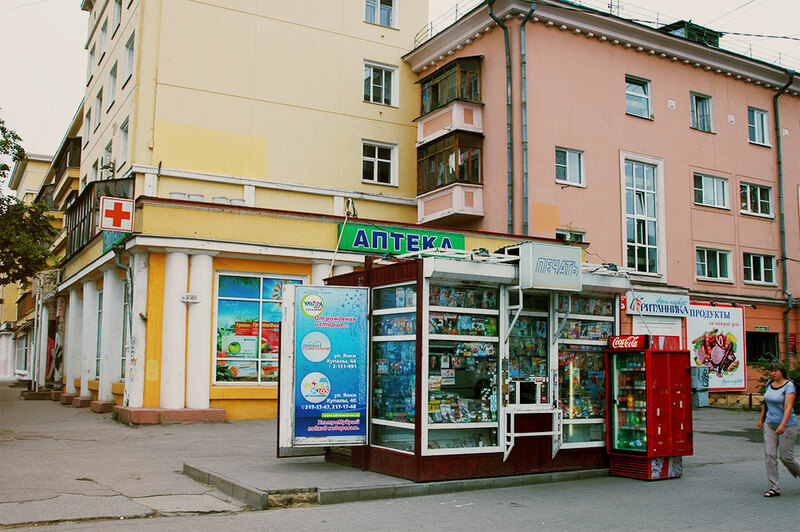 The second, Ilyich Prospekt, is lined with modest four-storey houses. The district was constructed in the 1930s for workers at the contemporaneously-inaugurated Gorky Automobile Plant (GAZ), a plant built on Fordist lines with the participation of American experts. 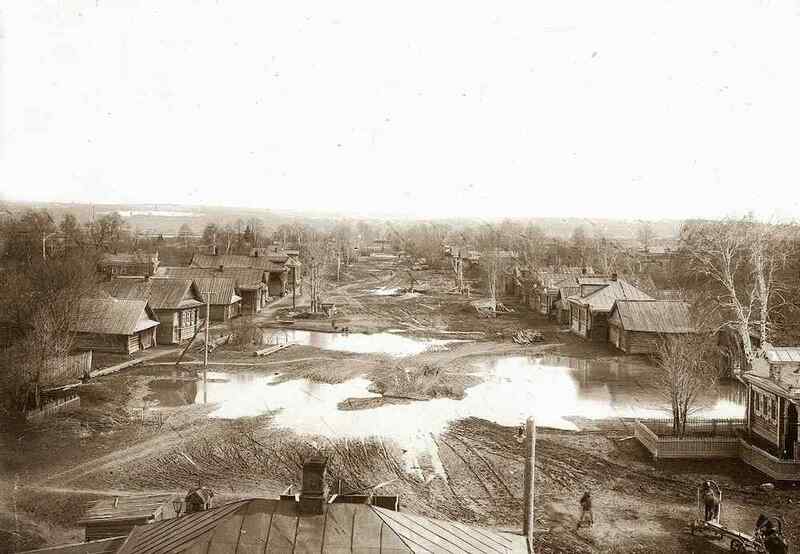 A good number of foreigners had come to Nizhny Novgorod then, the Great Depression having thrown a major spanner in the works of the west’s economy. Local builders and the initial workforce at GAZ were a motley bunch too. There were residents of villages currently being demolished, Ukrainian peasants fleeing the Holodomor and a labour force — now organised in Stalin’s new manner — amassed specially for the crucial construction project. At the end of the 1930s this human diversity was steamrolled by repressions and inevitable social unification. 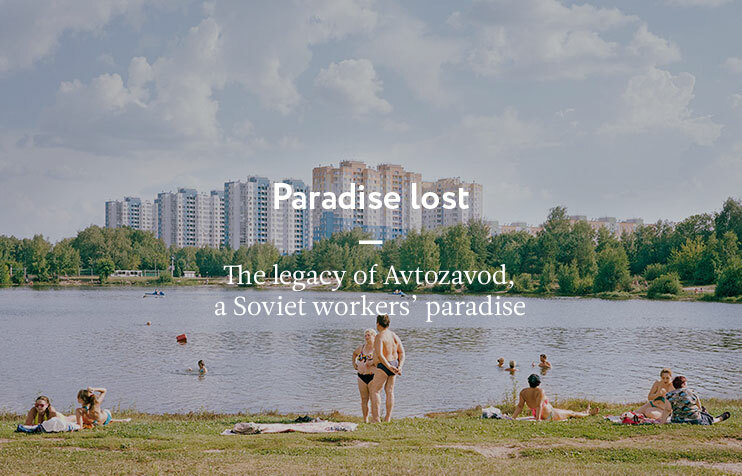 By the time I’d begun to understand just where it was that I lived (that is, by the end of the 1960s and the beginning of the 1970s), Avtozavod represented an example of the most fundamental social structure of Soviet society in its almost ideal state: the working class plus the working intelligentsia. To a certain extent, what we had here was a utopia incarnate of a moderate pre- and post-Stalin socialism. Social justice plus internationalism plus industry and the total technical enlightenment of the once-ignorant peasantry. Architecturally speaking, the district — inhabited by slightly fewer than 300,000 people — was divided into several segments. Its nucleus comprised two so-called “Sotsgorods” (socialist cities), the first of which was built at the same time as the plant itself. There were typical Stalin-era buildings: formidable, picturesque, you might even say majestic — or so it seemed at the beginning of the 1970s. Alongside these stood constructions just as old but a little more modest. Four-storey tenements, with no bells and whistles, as well as pretty nasty baraks — shabby communal housing lacking even basic facilities — which survived almost till the end of the 1970s. A little off to the side stood a diminutive neighbourhood of fine two-storey houses built for the American experts: the “American Village”. 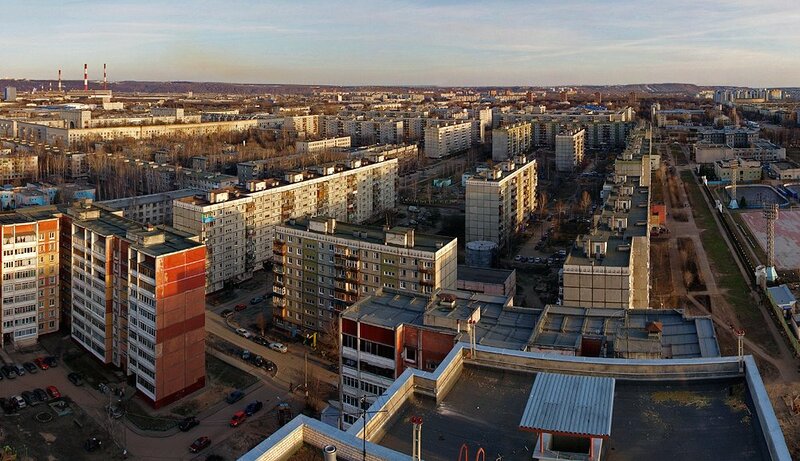 Later, all this was surrounded by cheap new Khrushchev-era buildings, and then by the nine-storey panel buildings. 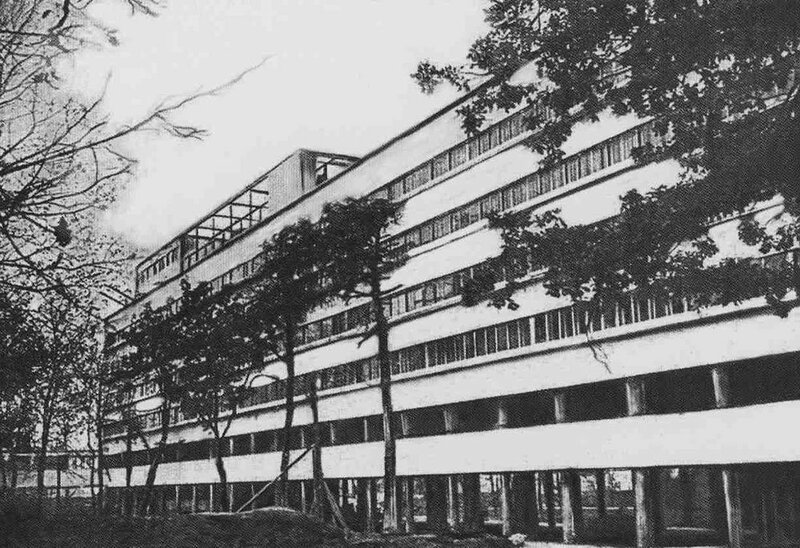 The period from the late 1970s through the mid-1980s saw the construction of a considerable number of very large houses, namely those on Zhdanov Prospekt, neighbouring the Stalin-era Avtozavod Park, next to the incredible Radius House, the upshot being that the Stalinist-era buildings of Sotsgorod stopped looking so impressive: now, oddly enough, they seemed rather cosy, even cute, in the manner of Stalin-era films such as The Swineherd and The Shepherd and Cossacks of the Kuban. 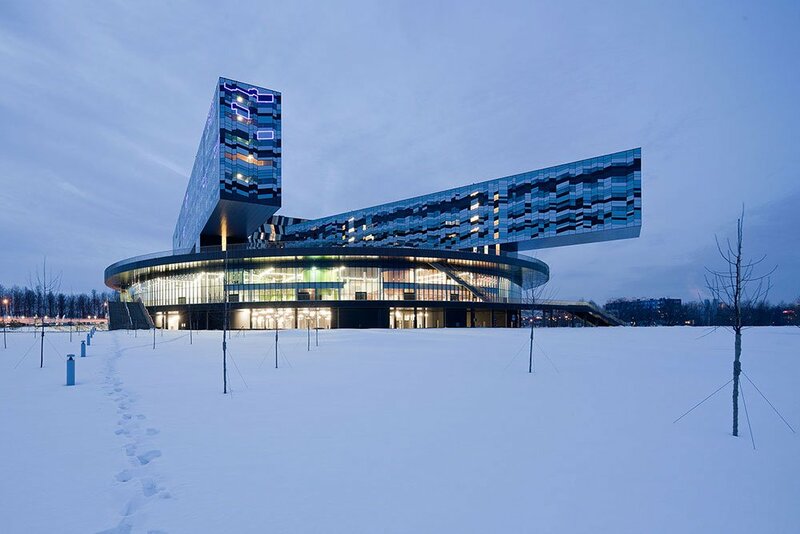 Divested of its historical, cultural and ideological contexts, this architecture lost its meaning. 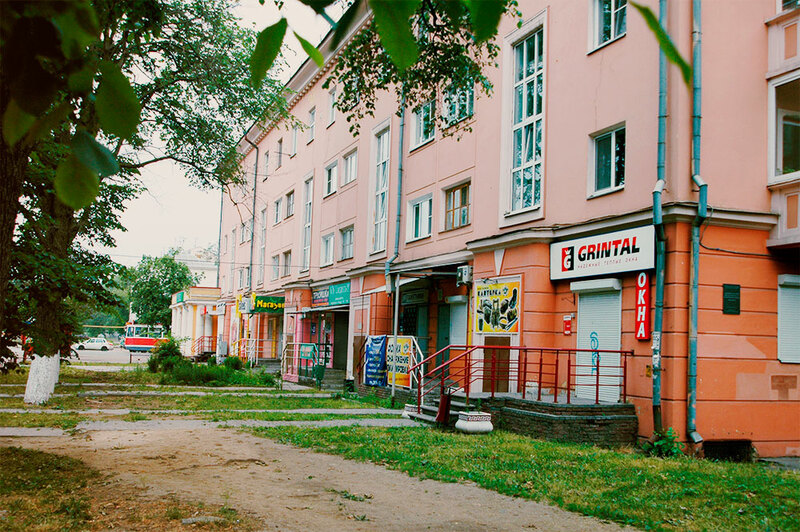 Number 4 Kirov Prospekt, where I lived, made up one side of a huge, almost-square rectangle — one of the so-called “Busygin yellows”. There were also “Busygin greys”: here, the Stalinist Empire style had attained the heights of ancient Babylon. The “yellows” were a tad more modest, but nonetheless inspired a certain trepidation, and of course, the envy of those left cooped up in the baraks. The “greys” came to be populated by big bosses and the most highly valued staff; the “yellows”, by ordinary bosses and the quite highly valued staff. Both were named after Stakhanovite worker Alexander Busygin, who in September 1935 forged 1,001 crankshafts in a single shift, smashing all records. Busygin was actually housed in one of these buildings: a few years ago I was surprised to discover that the old hero had lived on until 1985, which meant that our paths must no doubt have crossed somewhere on the streets of Avtozavod. The “yellows” were very green inside: the huge courtyard wasn’t really a courtyard in the usual sense of the word. Rather, it was something like an English garden square, only instead of tidy paths, benches and manicured bushes, it featured playgrounds for two kindergartens, socialising spots for residents of different ages (benches, tables, swings), and, if memory serves, two areas for playing football. Come winter, our corner of the courtyard would be transformed into an ice rink and hockey would take the place of football. By the beginning of the 1970s all this was wildly overgrown, so the strict architectural rectangle of the “yellows” resembled the set from some post-apocalyptic movie that plays out in the ruins of an ancient jungle city. These really were ruins; or, more precisely, they were the foretaste of the ruins to come, the ruins of several social orders all at once. The first epoch to be ruined was the overture to classical Stalinism. Anyone who sees Soviet totalitarianism as the domain of identical details, a sort of biomass of elements denuded of specific traits and statuses, is seriously mistaken. The Stalinist order, even in its comparatively early incarnations, was predicated on profound social inequality. In addition to torture chambers and hard labour, it wielded another highly effective social instrument — the system of incentives and privileges. Having destroyed one part of the intelligentsia, the regime bought another. In some sense, the Stalinist regime was socially highly disarticulated and complex since it was founded on the idea of using material comfort as a reward for total and absolute loyalty. Moreover, it’s difficult to imagine there being any sort of serious discussion about social justice in the USSR from the late 1930s to the early 1950s. Number 4 Kirov Prospekt, like the neighbourhood as a whole, represents the perfect embodiment of this idea: the castle of the new elite, the bastion of those who were allowed to climb the social ladder and stay at the top. What’s most remarkable is that the naked pragmatism of Stalinism goes unnoticed: there are baraks for the ordinary workers, tenements for the plant’s foremen and junior management, the Busygins for engineers, administrators and party officials — and, of course, for Busygin himself, as well as a handful of other miraculous record-breakers occasionally paraded before the masses like circus animals. The Avtozavod district was conceived in such a way as to preclude horizontal, inter-group social ties transcending the confines of our living units. Which is why the Busygins create the impression of a large, siege-ready citadel. They offer everything from nursery schools to shops. In fact, Kirov Prospekt abuts the entrance to the car plant — the entire itinerary of life in a nutshell: work-citadel-work. Perpendicular to Kirov Prospekt there is a street leading to the Park of Culture and Rest (laid out around the same period), with its oriental wooden arches and gazebos, its wooden, Thousand-and-One-Nights fantasy of a summer cinema, its arrow-straight alleys and fountains, and the grand Mir cinema, almost Albert Speer-like in execution, upon whose roof stand male workers holding callipers and female workers in skirts and kerchiefs holding books. Before us is a maximally rationalised world, simply and ruthlessly organised, partitioned in accordance with the will of the state. I repeat: what it lacks, above all, is socialism with any idea of social justice, or communism with its utopianism and its indestructible faith in the equality of all people. As far as I can see, it was under Khrushchev that the collapse of this order began — in Avtozavod no less than in the USSR as a whole. Khrushchev tried to be a socialist (and even a communist) in a country that had long lost any conception of socialism. In a way, he tried to give it a sense of its future, even if he did so by telling farcical fables about the triumph of communism 20 years hence. One of the elements of Khrushchev’s turn to substantive Marxism-Leninism was his construction programme. Rejecting the lavish monumentalism of Stalinist architecture, Khrushchev resolved to provide the populace with inexpensive but perfectly decent housing. Babylon was supplanted by Bauhaus, and the Busygins found themselves in the company of five-storey brick-clad blocks, built with smaller and less pompous apartments. The conception of the citadel towering over a mass of pitiful little huts was displaced by a totally different panorama. Social divisions persisted but were no longer pivotal. The proud Stalin-era boss found himself amidst a throng of workers; the distance didn’t disappear, of course, but the possibility emerged of horizontal connections between different groups of Soviet people. Number 4 Kirov Prospekt now stood at the head of a row of buildings, all approximately the same height, stretching off towards the rising sun. Trams trundled down the road, while the untrimmed greenery further smoothed out the now purely aesthetic disparities between the Stalinist Empire style and Khrushchevian-Brezhnevian pragmatism. The population of the Busygins grew ever more mixed: people died, divorced, married, swapped apartments. The social status of local inhabitants was becoming completely blurred; the neighbourhood’s old-timers and their progeny strolled about the park and along the road, proud and ridiculous, like Faulknerian plantation-owners in the wake of the Civil War. A new social life might have developed here, with horizontal ties and a sense of belonging to the local community, not least because this was encouraged by a few purely local issues, like everyone’s shared obsession with hockey team Torpedo Nizhny Novgorod whose home ground was just over the road. But it was not to be. Then the Soviet Union collapsed in 1991 and all this came to an end. 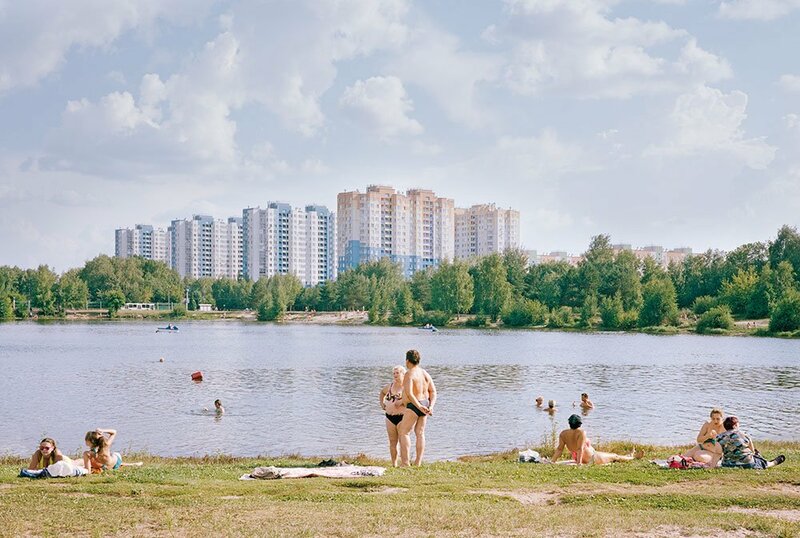 Essentially, the Busygins, the Avtozavod District, GAZ and large swathes of the country as a whole remain in much the same condition to this day, in spite of all the colossal external changes. All sorts of people live in the neighbourhood, from old desperate alcoholics to semi-destitute teachers to the lower strata of the local middle class. Nevertheless, the social structure of post-Soviet society is absolutely resistant to rationalisation. These masses are not amorphous; they are atomised. 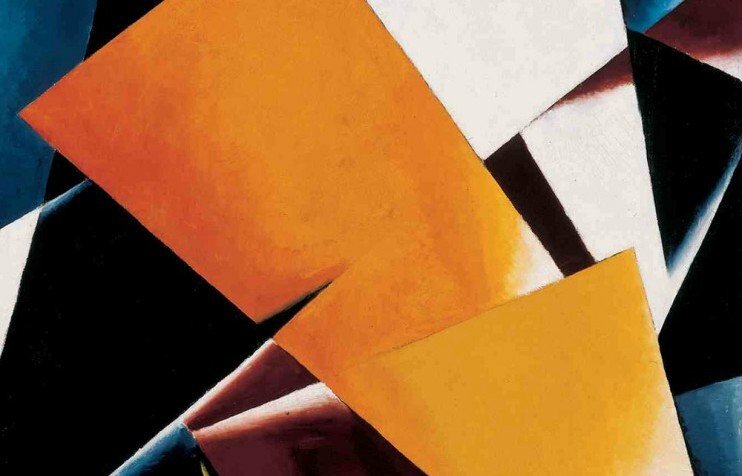 The horizontal ties between people that suddenly became possible in the 1970s are now out of the question — post-Soviet atoms don’t enter into reciprocal relationships with each other, they don’t form molecules. This becomes fairly evident if you take a look at what’s happened on the ground floors of the neighbourhood. When private property and capitalism were introduced to post-Soviet Russia, small-scale trade and the service economy became the principal occupation of the semi-destitute populace. Endless kiosks, cafes, workshops, dubious offices of various kinds — all this gave the impression that the Second World had been conquered by the Third, that Karachi had triumphed over Stalingrad. But gradually — save for a few occasional stalls and offices — it all disappeared. The force-lines of post-Soviet life converge upon the gigantic new shopping centres, solidifiers of social atomisation. The citadel is now to be found in the shopping mall, the place most indifferent to social status in the world. Meanwhile, here on Kirov Prospekt and on Komsomolskaya Street is a village of giant tattered buildings in various styles — blocks of flats inhabited by disconnected individuals who’ve been deprived of a future and who (in the absence of even the slightest social solidarity with their neighbours) do not comprehend the present, and thus are left longing for a past when everything around them had some sort of meaning — fallacious and illusory perhaps but meaning nonetheless.